The call came in to BHGE Service Director Wassim Younes at 2:30 on a Thursday afternoon, just hours before the weekend began in the Middle East. It was from one of the largest Liquid Natural Gas (LNG) producers in the world. 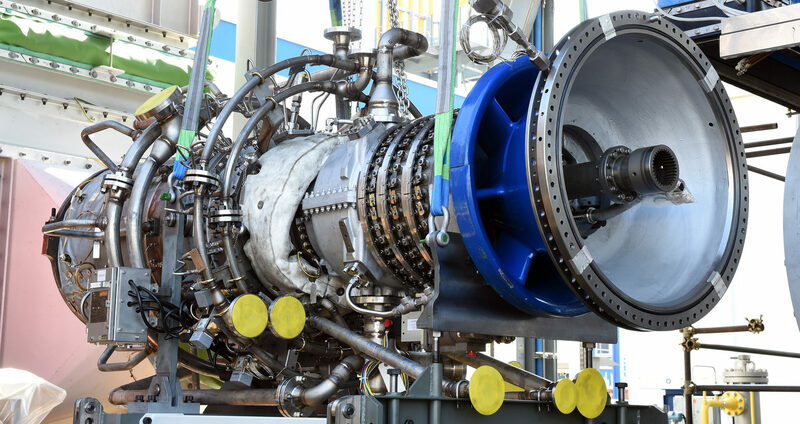 They had unexpectedly lost production from one of their Train 2 configurations, requiring a complete gas turbine unit change out. The scope of this project was complex as an LNG train has multiple gas turbines (engines) and compressors configured end to end, that work together in the process of creating a cryogenic cooling medium that converts the gas into a liquid state as the gas flows over it. In the case of this Train 2, there were 5 engines driving 5 centrifugal compressors supporting the creation of liquid natural gas. In the high-stakes oil and gas industry, ANY unexpected outage at a plant can result in market disruption and a significant loss in revenue. Timing, expertise and localization were critical requirements to properly execute in this situation. Within five hours of the call to BHGE, FieldCore was deploying a crew and tools to start work. This began with a borescope team to assess the full extent of the situation and then, a maintenance team to fix the problem..
FieldCore was formed to help plants prevent and reduce the financial risk of such unplanned outages but the company is uniquely positioned to succeed and minimize downtime when unplanned outages do occur; especially when partnering with a fellow GE company like Baker Hughes (BHGE). Localization, standard processes, expertise and customer familiarity all played a critical role in successfully putting this Train back online. Normally a modular replacement is done in conjunction with replacing other modules (i.e. the 5 engines are changed at the same time). This process normally takes nine -10 days. Planned singular modular replacements typically take seven and a half days. FieldCore executed this singular modular replacement in just six days, a marked improvement when it was needed most! The turnaround time was not the only success however. The FieldCore team delivered fully on the company promise of “World-Class Execution” by having ZERO quality or safety incidents during those intense days. Perfect execution. The success of this outage cannot be claimed by great processes and tools alone. It was driven by great people in different organizations who came together at a critical time. Raymond Gutierrez was the FieldCore Service Manager who lead the team, coordinating the efforts of the different support groups. Raymond leveraged his work relationship with the BHGE, CPM and SM which helped tremendously during a forced event in the peak outage season. Joravar Singh works in FieldCore’s local tool center. He made sure that the field services team was tooled up properly for execution, and leveraging his relationships with on-site customer staff, assured all rigging & calibration inspections were promptly executed prior to site entry. He and his team remained on call 24/7 to make sure tooling did not become an obstacle at any time during execution. Of our global portfolio, this customer represents one of the most critical LNG plants that FieldCore and BHGE supports in the global market. To deliver upon FieldCore’s promise of world-class execution and meet the challenges of a forced outage of this scope with perfect Quality and EHS metrics is truly remarkable!